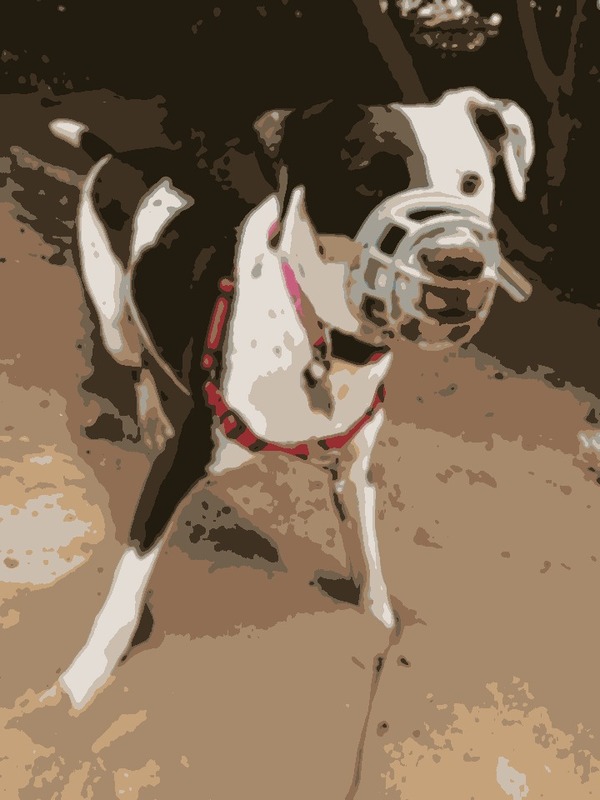 The other day, I was walking one of my private training clients, a female pit bull mix who also happens to wear a Baskerville muzzle. As we passed a group of people in the park, one commented, “That dog bites.” Ironic, as this dog has no bites on record. The simple phrase gave me pause and reinforced the work that needs to be done to reduce muzzle stigma and increase awareness as to why dogs wear muzzles. The dog in question wears a muzzle as prevention. Despite having no bite history, she is very fearful of strangers, new environments and certain dogs. She sometimes becomes over aroused when she plays with other dogs, snapping the air and pinning them to the ground. She was rescued as an adult, so it’s unknown whether a bite would leave no marks or would cause serious damage. Given this knowledge, the muzzle, along with training and management of her interactions with other people and dogs, keeps bite records and dangerous dog laws at bay and keeps her quality of life high. Another dog I used to walk was obsessed with eating other dogs’ feces, so much so that he would make himself sick. The temptation to eat was so strong that “leave it” commands and recall practice were of little use. His quality of life suffered because he rarely went on off-leash walks in the park because of his endless need to seek out dog feces. With help from the owners, we trained him to wear a muzzle, which prevented feces consumption. Management in place, we were able to work on recall and “leave it,” and give him more off-leash privileges as a result. In yet another scenario, one of my private training clients’ dogs wore a muzzle because of his struggles with impulse control. He put his mouth on limbs, clothing, the leash, you name it. We needed to stop the behavior to prevent the bad habits from continuing, so we trained him to wear a muzzle while we worked through the necessary training plans. Eventually, he got to the point where the muzzle became less necessary. The message in all of this: Dogs wear muzzles for a plethora of reasons. It’s important to educate the public on why dogs wear muzzles so that we reduce stigma and begin to view muzzles as a positive thing, not something to fear. Tell us: Why do you muzzle? My dog has a licking/ chewing habit (himself, not others) and sometimes the muzzle seems a kinder option than the e-collar. However, we are sparing in the use of it. We have discovered the inflatable collar prevents him from attacking his underbelly and tail area, the most sensitive areas. And, yes, we do have vet care for him. Allergy shots, limiting his food, etc. Piece of mind with a fearful dog. My dog has nipped at running children and bikes. She is much better now with training but I never want to have a bite record for her. I have no “mouth” issues with my dogs therefore I do not muzzle as it’s unnecessary. However, I am aware that the muzzle does not automatically mean a dog is dangerous. I don’t believe a muzzle is cruel either and in some cases it may prove to be cruel NOT to use one if needed. I have a dog reactive dog who has WONDERFUL bite inhibition but has been attacked by dogs on many occasions, no damages results (except a scratch when someone put their hand in the dog’s faces!). She wears a muzzle because even with it, people enjoy trying to sneak up behind me when I’m training to freak her out so they can have a good laugh, or when meeting new dogs as a precaution since she’s had so many bad experiences. LOVE this article. yes… absolutely… I cried when I had to buy a muzzle for our baby, as she used to nip at hands when she was younger.People thought our baby was a biter-she’s not, But, we were worried that kids would throw rocks, or the idea of a muzzle would invite aggression from the police if going through police check. We soft-muzzled our first dog, Chief, for a short period because he displayed aggressive behavior toward our first son when he was little. He grazed him after being startled and it escalated to resource guarding. After consulting a behaviorist who specialized in aggression, we learned how to manage it so that we could put the muzzle away. Chief was a sweet dog to my husband and me and was very obedient (outstanding recall). He just didn’t like small children, so we made sure he had his space, and we taught our kids to respect him. Fortunately, he was an excellent communicator, and in his later years he simply avoided the kids. They enjoyed him from afar….he and our other dog, Gypsy, loved to chase each other around the yard and it made the kids laugh hysterically.